Restaurant owner/operator for a minimum of 3 years. Motivated, passionate operator able to meet the demands of multi-unit development and operations. Operating partner who will live in the development territory. Experience and desire to give back to the community in which the restaurant resides. 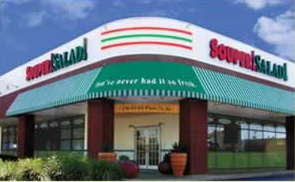 Souper Salad offers 2 types of franchise programs: Single Restaurant Franchises and Market-Level Franchises. The initial franchise fee for a single Souper Salad Restaurant is $29,500. The estimated initial investment required for a Souper Salad Restaurant, including the initial franchise fee, will range from $575,700 to $865,200. These sums are intended to be a reasonable guide, and do not include real estate lease costs. There will be other costs as well. Our minimum financial requirements are $150,000 in liquid assets and $500,000 in net worth, either individually or within the partnership. These sums are intended to be a reasonable guide, and do not include real estate lease costs. There will be other costs as well. Market-Level Franchises involve opening multiple restaurants within a defined area pursuant to an Area Development Agreement. There will be an area development fee multiplied by the number of restaurants (excluding the first restaurant) which will be opened. A prepaid initial franchise fee of $29,500 is required for the first restaurant; however this initial fee will be credited against the area development fee. Development costs for new Souper Salad restaurants are similar to the Single Restaurant Franchise, and similarly, there will be other costs as well. Souper Franchising Opportunities Now Available!!! Souper Salad restaurants are perfect for customers seeking a casual atmosphere with fresh, and healthy food. Now operating bustling locations in multiple states, we're pleased to invite you to join in the success of the growing Souper Salad family. Souper Salad is actively seeking experienced retail operators with proven expertise in the food service industry. Souper Salad franchisees must be experts in their markets, be willing to work diligently and provide full-time best efforts toward the success of the Souper Salad brand. We're currently seeking franchisees who possess integrity, offer positive reputations, and share Souper Salad's core business values. Financial strength is also key to success. We require that the Souper Salad franchisee invest a minimum of 20% of the total cost of the project in personal equity. If you meet the above qualifications and wish to take the next step, please request more information today. Click on Request Information button above for FREE information on how to start a Souper Salad franchise today! Please Note: Souper Salad franchises for sale, and other franchise opportunities, business opportunities, businesses and franchises for sale on this web site are not to be considered as an "offering", "franchise offering", suggestion or recommendation by GlobalBX. The franchises, businesses and business brokers seen on this web site submit their own individual content. This advertisement depends entirely on the truthfulness of the information provided by our advertisers which includes, but is not limited to, franchisers, franchises, franchise brokers, franchise consultants, business sellers and business brokers. As always, GlobalBX recommends that you consult a lawyer, financial consultant, accountant or professional advisor before buying a franchise or business opportunity or any type of business. By submitting this form and requesting more information, you have agreed to all terms and policies of GlobalBX and the business and franchise offerings listed here. Please review our Terms & Conditions for more information.